ریخته گر, فرشید, شبستری, سعید, ثقفیان, حسن. (1396). بررسی ریزساختار و خواص مکانیکی نانوکامپوزیت Al2024-CNT فرآوری شده به روش متالورژی پودر پولک. علوم و فناوری کامپوزیت, 4(1), 91-100. فرشید ریخته گر; سعید شبستری; حسن ثقفیان. "بررسی ریزساختار و خواص مکانیکی نانوکامپوزیت Al2024-CNT فرآوری شده به روش متالورژی پودر پولک". علوم و فناوری کامپوزیت, 4, 1, 1396, 91-100. ریخته گر, فرشید, شبستری, سعید, ثقفیان, حسن. (1396). 'بررسی ریزساختار و خواص مکانیکی نانوکامپوزیت Al2024-CNT فرآوری شده به روش متالورژی پودر پولک', علوم و فناوری کامپوزیت, 4(1), pp. 91-100. ریخته گر, فرشید, شبستری, سعید, ثقفیان, حسن. بررسی ریزساختار و خواص مکانیکی نانوکامپوزیت Al2024-CNT فرآوری شده به روش متالورژی پودر پولک. علوم و فناوری کامپوزیت, 1396; 4(1): 91-100. امروزه ساخت و مطالعه نانوکامپوزیت‌های زمینه آلومینیم با مقاوم‌ساز نانوتیوب کربن مورد توجه بسیاری از پژوهشگران قرار گرفته است. روش‌های مختلفی برای فرآوری این نوع نانوکامپوزیت‌ها استفاده شده است. اما، روش‌های بر پایه متالورژی پودر با توجه به پایین‌تر بودن دما و کنترل بهتر فرآیند، بیشتر مورد توجه بوده است. در تحقیق حاضر با هدف ساخت نانوکامپوزیت با زمینه آلومینیم 2024 و افزودن CNT wt.% 5/1، از روش متالورژی پودر پولک با سنتز تر در محیط سیال برای تولید پودر کامپوزیت استفاده شده است. سپس با استفاده از تفجوشی اولیه پودر با روش پرس سرد و تفجوشی بدون فشار در دمای oC 550، قرص های اولیه از آلیاژ Al2024 و کامپوزیت Al2024-CNT ساخته شد و تحت عملیات اکستروژن داغ قرار گرفت تا مفتول نهایی به قطر mm 10 حاصل شود. 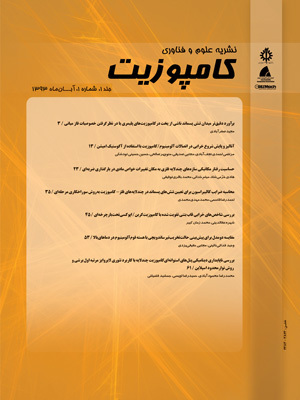 در ادامه محصولات با استفاده از آزمون‌های کشش، فشار، سختی و چگالی سنجی، XRD و رامان مورد مطالعه قرار گرفتند. با بهره‌‌گیری از مزایای روش تر، توزیع یکنواخت CNT در زمینه Al2024 همراه با حفظ کامل آن‌ها در محیط سیال، با استفاده از FE-SEM مشاهده شد. در نمونه Al2024-1.5wt.%CNT، استحکام تسلیم و استحکام نهایی به میزان 28 درصد در مقایسه با نمونه Al2024-O و به مقدار 20 درصد در استحکام تسلیم و 15 درصد در استحکام نهایی نسبت به نمونه Al2024-T6 افزایش یافت. پس از متراکم سازی بهینه، چگالی نسبی در نمونه‌های کامپوزیت Al2024-CNT تا 6/95 درصد، میزان سختی تا HB 90 و استحکام فشاری تاMPa 547 بهبود یافت. همچنین علاوه‌ بر فازهای بین فلزی Al2Cu و Al2CuMg در نمونه‌های آلیاژی، وجود فاز کاربیدی Al4C3 پس از عملیات تفجوشی در نمونه کامپوزیتی اثبات شد. Nowadayas, manufacturing of carbon nanotube reinforced aluminium matrix nanocomposites have been studied by many researchers. Different techniques have been used for possessing of Al-CNT nanocomposites. But, the powder metallurgy methods have been more attractive because of the lower temperature and better control of process. In the current research, the flake powder metallurgy route was used as a slurry based method to produce Al2024-CNT nanocomposite with 1.5wt.% CNT as reinforcement. Then, the initial compacted billets of Al2024 alloy and Al2024-CNT composites were produced by cold pressing of powders. They were sintered at 550 oC and the billets were hot extruded to produce rods with 10 mm in diameter. The produced samples were investigated by means of tension, compression, hardness, density measurement, XRD, and Raman tests. The uniform dispersion of CNTs within Al2024 powder was observed using FE-SEM. It was related to the merits of wet synthesis of composite powder. In Al2024-CNT sample, the yield and ultimate strength was increased about 28% in comparison with Al2024-O; It was also increased about 20% in yield strength and 15% in tensile strength compared with Al2024-T6 sample. After optimum sintering process, the relative density, hardness, and compressive strength of Al2024-CNT nanocomposite have been increased through hot extrussion to 95.6%, 90 HB, and 547 MPa, respectively. In addition to Al2Cu and Al2CuMg intermetallics in alloyed samples, Al4C3 carbide phase was proved to be formed after sintering in composite specimen. "Nanocomposite", "Slurry-based method", " Carbon nanotube", " homogeneous dispersion", " mechanical properties"
 Liao, J. and Tan, M., “Mixing of Carbon Nanotubes (CNTs) and Aluminum Powder for Powder Metallurgy Use,” Powder Technology, Vol. 208, pp. 42-48, 2011. Liao, J. and Tan, M., “A Simple Approach to Prepare Al/CNT Composite: Spread–Dispersion (SD) Method,” Materials Letters, Vol. 65, pp. 2742–2744, 2011. Yoo, S. Han, S. and Kim, W., “Strength and Strain Hardening of Aluminum Matrix Composites with Randomly Dispersed Nanometer-Length Fragmented Carbon Nanotubes,” Scripta Materiallia, Vol. 68, pp. 711-714, 2013. Pérez-Bustamante, R. Pérez-Bustamante, F. Estrada-Guel, I. and Santillán-Rodríguez, C., “Characterization of Al2024-CNTs Composites Produced by Mechanical Alloying,” Powder Technology, Vol. 212, pp. 390-396, 2011. Simoes, S. Viana, F. Reis, M. and Vieira, M., “Influence of Dispersion/Mixture Time on Mechanical Properties of Al-CNTs Nanocomposites,” Composite Structures, Vol. 126, pp. 114-122, 2015. Chunfeng, D. Xuexi, Z. and Dezun, W., “Chemical Stability of Carbon Nanotubes in the Al2024 Matrix,” Materials Letters, Vol. 61, pp. 904–907, 2007. Poirier, D. Gauvin, R. and Drew, R., “Structural Characterization of A Mechanically Milled Carbon Nanotube/Aluminum Mixture,” Composites: Part A. Vol. 40, pp. 1482-1489, 2009. Esawi, A. Morsi, K. Sayed, A. and Gawad, A., “Fabrication and Properties of Dispersed Carbon Nanotube-Aluminum Composites,” Materials Science and Engineering A, Vol. 508, pp. 167-173, 2009. Kwon, H. Park, D. Silvain, J. and Kawasaki, A., “Investigation of Carbon Nanotube Reinforced Aluminum Matrix Composite Materials,” Composites Science and Technology, Vol. 70, pp. 546-550, 2010. Simoes, S. Viana, F. Reis, M. and Vieira, M., “Improved Dispersion of Carbon Nanotubes in Aluminum Nanocomposites,” Composites Structures, Vol. 108, pp. 992-1000, 2015. Bustamante, R. Pérez-Bustamante, F. Guel, I. and Jiménez, L., “Effect of Milling Time and CNT Concentration on Hardness of CNT/Al2024 Composites Produced by Mechanical Alloying,” Materials Characterization, Vol. 75, pp. 13-19, 2013. Choi, H. Min, B. Shin, J. and Bae, D., “Strengthening in Nanostructured 2024 Aluminum Alloy and Its Composites Containing Carbon Nanotubes,” Composites: Part A, Vol. 42, pp. 1438–1444, 2011. Pérez-Bustamante, R. González-Ibarra, M. González-Cantú, J. and Estrada-Guel, I., “AA2024-CNTs Composites by Milling Process after T6-Temper Condition,” Journal of Alloys and Compounds, Vol. 536, pp. 17-20, 2012. Tang, J. Fan, G. Li, Z. and Li, X., “Synthesis of Carbon Nanotube/Aluminium Composite Powders by Polymer Pyrolysis Chemical Vapor Deposition,” Carbon, Vol. 55, pp. 202-208, 2013. Jiang, L. Li, Z. Fan, G. and Cao, L., “The Use of Flake Powder Metallurgy to Produce Carbon Nanotube (CNT)/Aluminum Composites with A Homogenous CNT Distribution,” Carbon, Vol. 50, pp. 1993-1998, 2012. Jiang, L. Fan, G. Li, Z. and Kai, X., “An Approach to the Uniform Dispersion of A High Volume Fraction of Carbon Nanotubes in Aluminum Powder,” Carbon, Vol. 49, pp. 1965-1971, 2011. Rikhtegar, F. Shabestari, S. and Saghafian, H., “Investigation on the dispersion mechanism of carbon nanotubes in Al matrix during processing of Al-CNT nanocomposite using slurry based method” In Persian, Journal of Iranian Metallurgical Engineering Society Vol. 56, pp. 3-10, 2015. Rikhtegar, F. Shabestari, S. and Saghafian, H., “The Homogenizing of Carbon Nanotube Dispersion in Aluminium Matrix Nanocomposite Using Flake Powder Metallurgy and Ball Milling Methods,” Powder Technology, Vol. 280, pp. 26-34, 2015. Wang, S. and Starink, M., “Precipitates and Intermetallic Phases in Precipitation Hardening Al–Cu–Mg–(Li) Based Alloys,” International Materials Reviews, Vol. 50, pp. 1-23, 2005. Brooks, C. “Heat treatment, structure and properties of nonferrous alloys,” Forth ed., ASM International, Metals Park Ohio, pp. 140-285, 1990.